You have come to the end of writing your book. The editing is over and you’ve set down the pen. The pages are being set into proofs. The one more piece that will make your book even more useful and relevant for years to come is a professionally prepared index. Anybody who has used an index successfully can appreciate the qualities of a good one. It points to information even when you don’t know the precise search term. It avoids sending you on wild goose chases. If you are picking up a book for the first time, a good index gives you the gist of the book, and that may give you reason to buy it. Those are the qualities I put into my indexes. My approach is dedicated to meeting the needs of the readers while accommodating your deadlines, page limits, and priorities. Using professional indexing software, I make the index conform to your style guide and specifications. And if you don’t have a style guide, I will make one that works best for the type of information and the prospective audience. Whether you have a book, documents, or a website, I will give an index that will make it more usable. I specialize in indexes for biographies, history, business, science, technology, cookbooks, travel, and nature. I love reading in a wide variety of subjects, so I am open to many different subjects. View my portfolio and samples of my work. You poured a lot of effort into your book to get your message out to the world. Keep the readers on your side by having your work proofread before it goes to print. My proofreading includes spelling, punctuation, captions, tables, and math (Do the numbers add up? Are the conversions correct?). At your request, I will also check dates, addresses, and foreign words. I make my marks on PDF files or on paper, whichever you prefer. I make my markups in red. If you are interested in my services, or would like to find out more, please send me an email or call me. I would love to discuss your project. 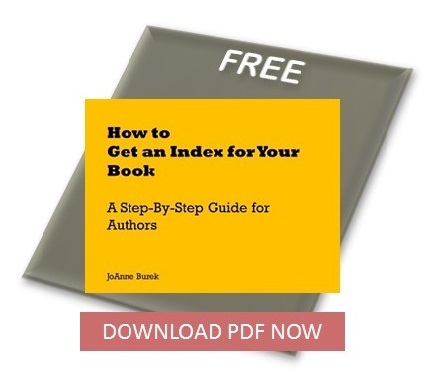 Wondering how you are going to get an index written for your book? This booklet shows you how.